Star Trek is coming back to TV. Unfortunately, it'll cost you $10 per month to see it. I've been a Star Trek fan since the early 70s, so I was super excited to hear there was a new series in the works. The series will be called "Star Trek Discovery" and it takes place about 10 years before the timeline of the original 1960s series. Why is the McDonald's menu so boring? They just need to mix things up a bit! Ever since McDonald's started serving breakfast all day, I've been thinking of ways they could blend their breakfast ingredients with their dinner and lunch items. The result is a mashup between the McChicken, and the Canadian Bacon on the Egg McMuffin... Toss in a bit of cheese and you get a McChicken Cordon Bleu! Of course, you can make this yourself by ordering both sandwiches, but why not put it on the menu? They've already got the ingredients. 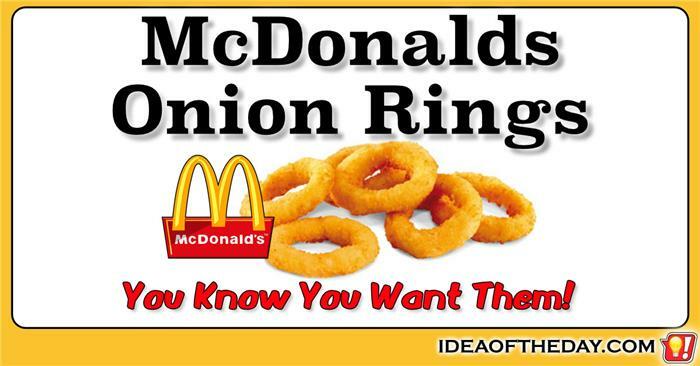 Why doesn't McDonald's have Onion Rings on the menu? Onion Rings are one of the most popular hamburger side dishes in the world. Unfortunately, you can't order them at the world's most popular hamburger restaurants. That's pretty strange when you think of just how popular they are at Burger King and White Castle, not to mention just about every other diner and restaurant that sells hamburgers. It makes you wonder what they're waiting for? I only buy McDonald's Iced Tea in the morning, because it tastes horrible at the end of the day! The most important thing about a fast food chain is product consistency. They spent decades perfecting a system so that when you order something from any McDonald's in the world, it will taste exactly the same as any other McDonald's, with no exceptions. Unfortunately, because of their efforts to be consistent, this means that no matter which McDonald's restaurant I've been to, whenever I order Iced Tea later in the day, it's NEVER as good as the Iced Tea they serve in the morning. That's because McDonald's doesn't refrigerate their Iced Tea, which makes their Unsweetened Iced Tea exceptionally bitter for the second half of the day. Why not put some HAM in HAMburger? McDonalds is always looking for new ways to add variety to their menu by adding all sorts of oddball limited time items, yet they often overlook the obvious, such as simply mixing ingredients they already have on hand. For example, why not take a few items from the breakfast menu and add them to some of the items from the lunch and dinner menu? 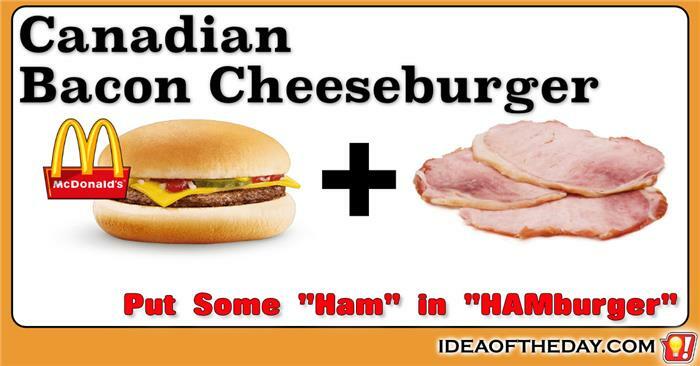 More specifically, a Canadian Bacon Cheeseburger. Think about it. Instead of regular bacon, why not Canadian Bacon? They already have it in stock for the Egg McMuffin. Now that they have an All Day Breakfast menu, it's at their fingertips all day long. 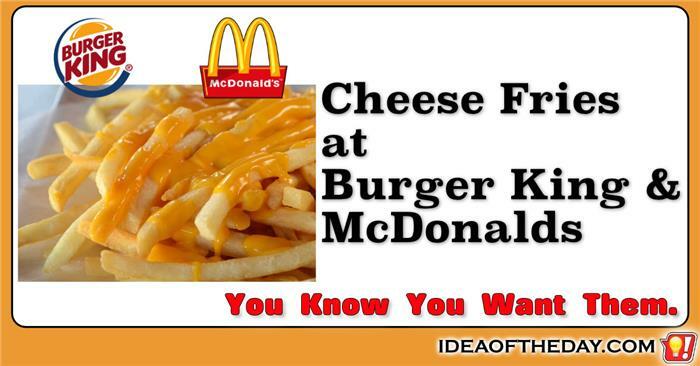 Everyone loves Cheese Fries, but you can't get them at Burger King or McDonalds. It sounds like a no-brainer to me. If people love cheese... and they love French Fries, you'd think you'd see Cheese Fries on the menu of just about every restaurant that serves fries. They already have the ingredients, so why not combine them? Wendy's has a history of offering a variety of toppings for their fries, including not only cheese, but chili and other toppings, but Burger King and McDonalds have never offered anything, which is odd, because it's a simple way for them to sell an upgrade using ingredients they already have on hand. To me the best Cheese Fries are at Nathan's Famous Hot Dog Restaurants. I rarely order fries from them any other way. Everyone loves double burgers, so why not a double McChicken? 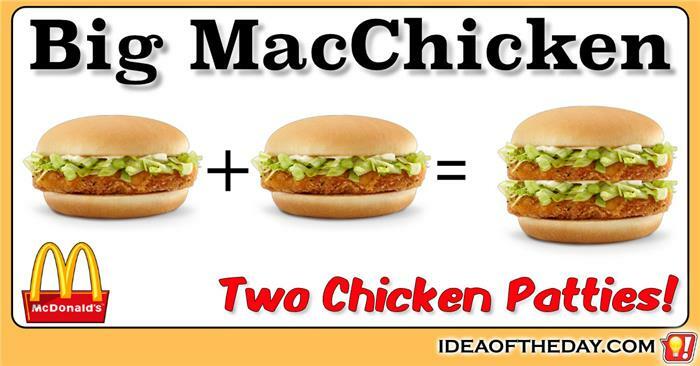 In the spirit of the Big Mac, which features two all beef patties, why not create a Big MacChicken that has two chicken patties? To me it's a no-brainer. Technically, a sandwich like this can go either of two ways. 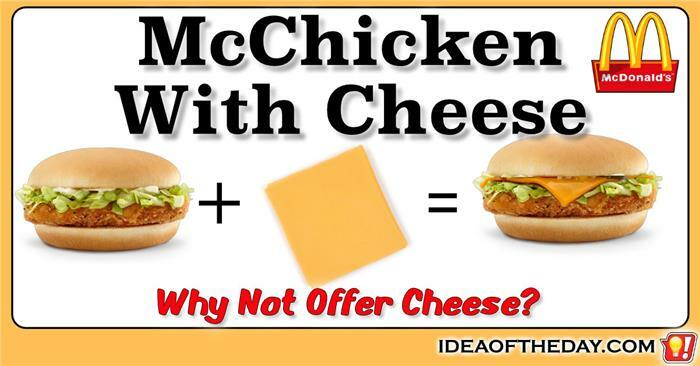 One way is to put together a regular McChicken, except using two pieces of chicken, but the bigger bolder move would be to build the whole thing exactly like a Big Mac, except with chicken. That means two chicken patties, Special Sauce, lettuce, cheese, pickles, onions and a sesame seed bun. A sandwich like that isn't just a bigger McChicken... it's better. Would you like these with your McChicken? 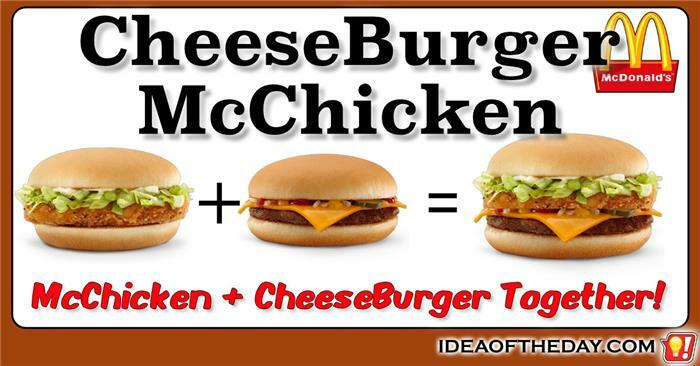 McDonalds is always looking for new ways to expand their menu. They've added things like Burritos, Mozzarella Sticks, and all sorts of new things, but what they often overlook are ways to expand and improve their menu by giving people more options with the items they already have. For example, the McChicken. It comes exactly one way, with lettuce and mayo. That's it. I think it's time McDonalds realizes there are other ways to serve their classic chicken sandwich. The most obvious change would be to offer cheese. It's not rocket science. They can offer this simple upgrade and I'm guessing a large percentage of people would buy it if they were asked. 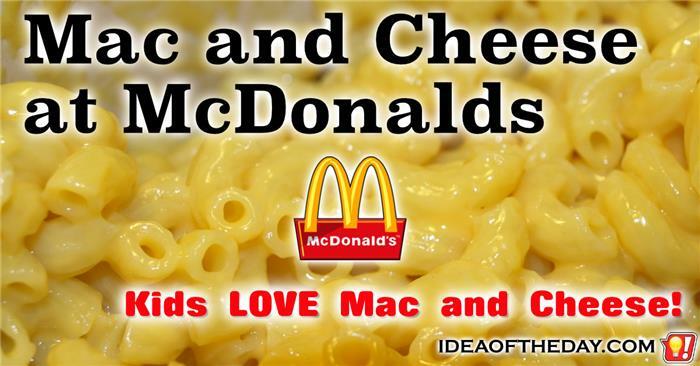 Kids love McDonalds... and Mac and Cheese. Many kids are fussy eaters, but one thing you can count on is that just about every kid loves Mac and Cheese. It's clearly one of the most popular foods for kids, which is why even upscale restaurants have Macaroni and Cheese on their Children's Menu. What I find funny is that you see Mac and Cheese on the menu in so many restaurants specifically because kids love it, yet McDonalds, which bends over backwards to appeal to kids doesn't have it on the menu. Fast food can be boring, so I like to mix things up whenever I get a chance. Some things go together, some things don't. This particular combination is pretty good. What makes this combination great is not just the unlikely combination of chicken and beef, but the addition of the Cheeseburger's onions, cheese and ketchup to the McChicken's mayo and lettuce. It makes you wonder why McDonalds doesn't offer lettuce and mayo as an option on all their burgers. If you order Eggs Benedict from a fancy restaurant, and ask them to hold the Hollandaise Sauce, you'll end up with an Egg McMuffin. 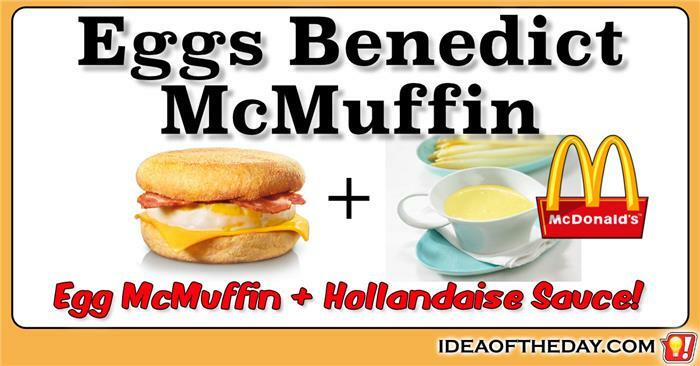 So why not offer an Egg McMuffin with Hollandaise Sauce? 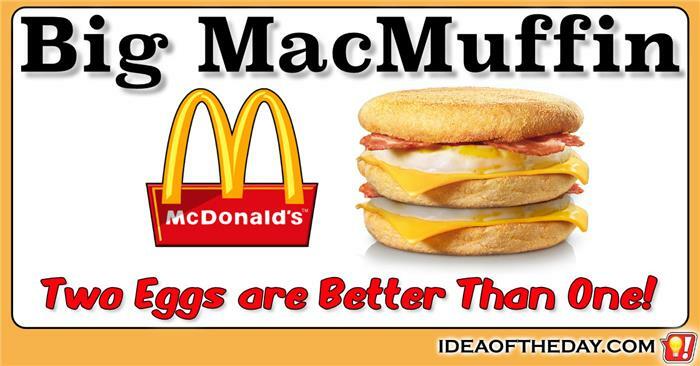 It's already a proven recipe, and it would be a great addition to McDonalds new All Day Breakfast Menu. Although a traditional Eggs Benedict is made with poached eggs, adding Hollandaise Sauce would be the perfect finishing touch to one of my favorite things at McDonalds. In fact, why not offer a choice of sauces. Egg McMuffins don't have any sauce. Maybe some people would like Ketchup, or even... Big Mac Sauce! When was the last time you had just one egg for breakfast? If you're like most people, chances are you always make two or more eggs at a time, so when you think about it, wouldn't it be great to have an Egg McMuffin with two eggs? Just call it the Big MacMuffin. Now that McDonald's has an All Day Breakfast Menu, the idea of a Big MacMuffin makes even more sense, especially for a lunch or dinner sized appetite. Just think about it... Two eggs, in a three layer muffin, with cheese and Canadian Bacon. If you look at the menu of almost any restaurant that sells hamburgers, you'll find Onion Rings... but you won't find them at McDonalds. Isn't that odd? Just about every roadside diner, steakhouse or specialty burger place has them, so you have to wonder why McDonalds still doesn't carry them. It's not like they're particularly hard to make. All they need is a deep fryer, and they have plenty of them. I had a theory for a while that they were holding back because they didn't want the taste of the onions getting into the fries, but that never stopped them from frying chicken, fish and mozzarella sticks. Besides, Burger King's been selling them for decades and I've never tasted onion in their fries, chicken, or french toast sticks. 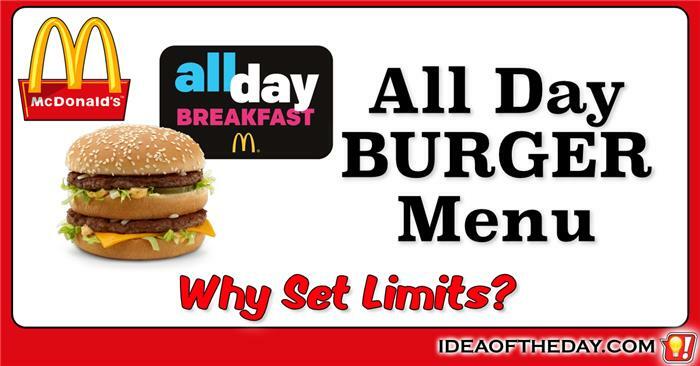 Now that you can get breakfast all day... why set limits on burgers? So far, it looks like McDonald's All Day Breakfast Menu is a big hit, which is no surprise, because people have been asking for it for years. I can't count the number of times I've walked into a McDonald's hoping to get an Egg McMuffin, only to be told they are no longer serving breakfast. Let's face it, when your taste buds are expecting breakfast, it's not easy ordering a burger instead. Eliminating the time restriction makes a lot of sense, especially for people who work late shifts. For them, breakfast starts about 6pm, but the main idea is that you should be able to order eggs any time of the day. If you think the All Day Breakfast Menu is freedom, try asking for a burger at 10am. Why limit Special Sauce to just Big Macs? When I think of McDonald's, I think Big Mac, mainly because I love the taste of their Special Sauce. Although they have a ton of items on the menu, the only item that has their signature Special Sauce is the Big Mac, which is a shame. 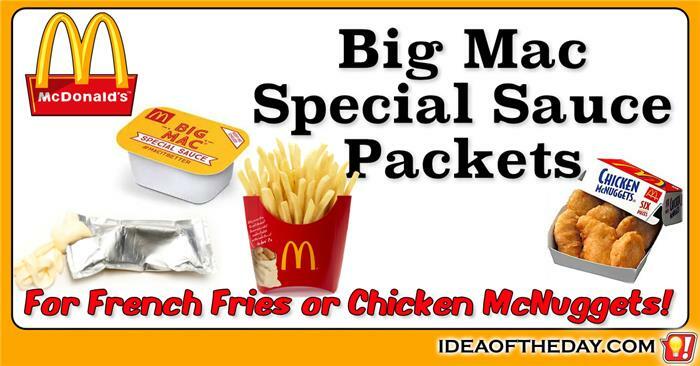 I would love to use Special Sauce on so many other items, including Fries, Chicken Selects and Chicken McNuggets. In fact, I would love to put it on just about everything on the menu. Just imagine dipping a Hash Brown in it. When you think about it, since Big Mac Special Sauce is their version of Thousand Island Dressing, doesn't it make sense that they at least offer it as a salad dressing? How obvious is that? There's something special about a mini burger. Like most people, the first time I had a "Slider" was at White Castle. My friend suggested I order 6 of them and I thought he was crazy, but then I realized how small they are. You can eat one in two or three bites. Before you know it, you've had a whole bunch and you're ready for more. Over the past few years, I've started to see sliders everywhere. 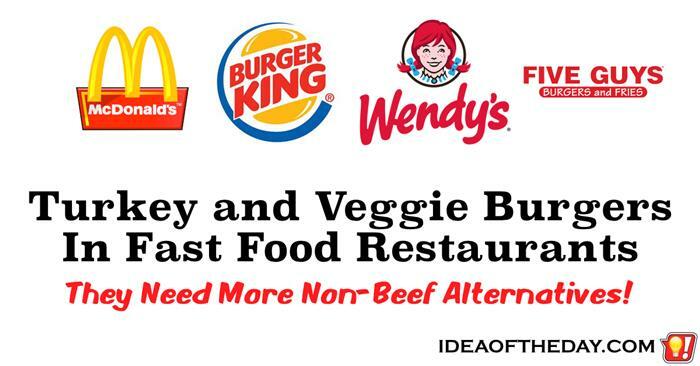 They're in big and small restaurants, and even some large chains like Ruby Tuesdays, but the biggest burger restaurants in the world like McDonald's, Wendy's and Burger King haven't jumped in on the bandwagon yet. 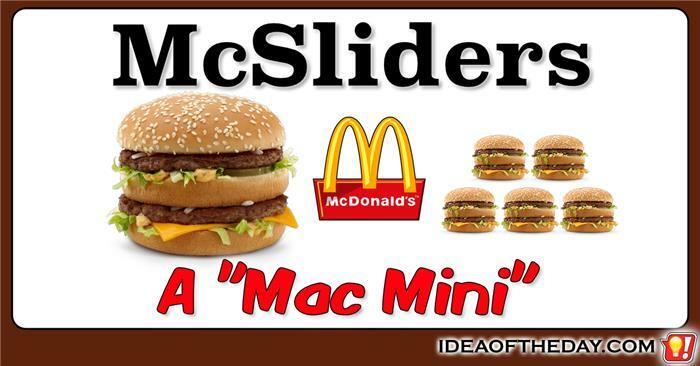 A McSlider would be half the diameter of their regular burger, perfect for snacking or eating in bunches. 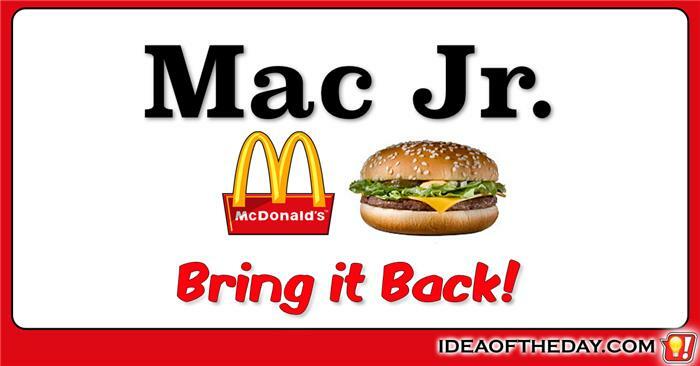 Bring Back the Mac Jr. Sometimes I need to eat while I'm driving, and that makes it hard to eat certain foods, like the Big Mac. As much as I love them, it's pretty hard eating them with one hand. I love the taste, especially of the Special Sauce, but everything falls all over the place. That's why I was excited when they introduced the Mac Junior in the early 90s. Everything you love about the Big Mac, except it was just one patty, instead of two. The only problem was that, it was for a limited time. Like the McRib, the Mac Jr. resurfaces from time to time, and they even offered a Mac Snack Wrap that had the same ingredients, but once again, by the time you realize they're offering it, it's gone. With HotCake Syrup on the side! Don't you just love Sweet Potato Fries? They're sweet. They're salty. They're simply delicious! So, why are they so hard to find? 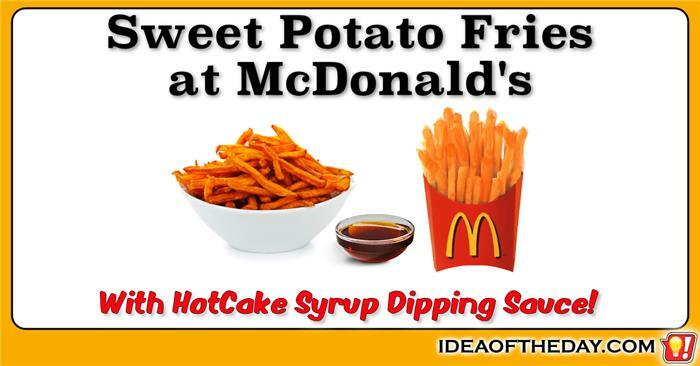 Sweet Potato Fries are popping up everywhere. You'll find them in some restaurants, but they're not quite mainstream right now. That's why I think this is the perfect time for a big restaurant chain like McDonald's to put them on the menu, so they can reach an even bigger audience. I'm sure they would be a big hit at McDonald's, especially if they offered a variety of dipping sauces, including Marshmallow Fluff and HotCake Syrup. YUM! If you're going into the burger business, shouldn't you make more than one kind of burger? Turkey burgers and veggie burgers are popular right now, so you can order one in just about any restaurant... except for fast food burger places. Isn't that odd? They're burger places, aren't they? So why only one kind of burger patty? I"m not suggesting that they remove beef from the menu. I'm simply suggesting that by adding turkey and veggie burgers to the menu, they are guaranteed to get customers who don't eat beef. To me, that's an untapped market.